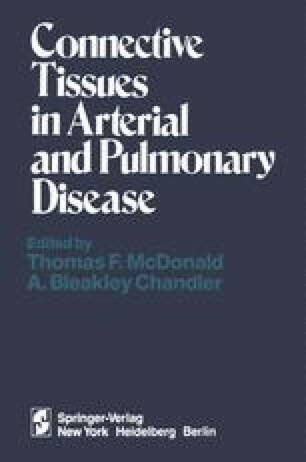 Elastic recoil is of paramount importance in the structural integrity and function of large blood vessels and key connective tissue elements of pulmonary tissue. The elasticity of these tissues is due primarily to the presence of elastic fibers. These fibers can be shown both morphologically and chemically to be composed of at least two major proteins. One of the components, elastin, possesses an amorphous appearance in electron micrographs and has a unique amino acid composition consisting of approximately 95% nonpolar amino acids (Ross and Bornstein 1969; Partridge and David 1955). The other major component, the microfibril, displays a fibrillar structure in electron micrographs and possesses an amino acid composition characterized by a high content of polar amino acids and a significant amount of cysteine residues (Ross and Bornstein 1969). Although the microfibrillar component has not yet been chemically well defined, it is possible that this component may represent a single or a family of related glycoproteins (Serafini-Fracassini et al. 1975). The relationship between the two components of elastic fibers is not chemically well understood; however, ultrastructural studies have provided strong evidence that during development of the elastic fibers the microfibril appears !irst in the extracellular matrix. The insolubilized microfibril is thought to act as a framework upon which soluble elastin is aligned and subsequently insolubilized (Ross 1971).